ARCHLine.XP is an architectural design software for BIM (Building Information Modeling), including features for interior design and decoration projects. 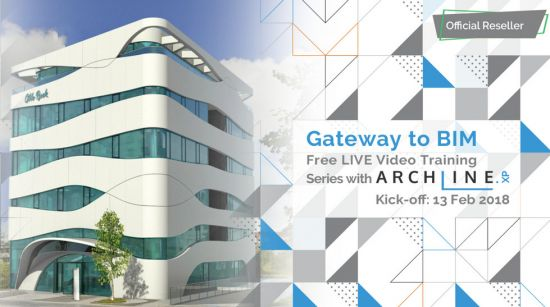 ARCHLine.XP supports the multi-disciplinary design process. It helps you to collaborate with co-designers through the IFC, DWG™, and RVT™ formats. The software includes the whole process of architectural design, interior design and the planning of bespoke furniture. The complete floor plan, 3D model and project documentation can be created within the software - the furnishing, tiling, lighting processes are fast and easy. The section views, construction details, printing layouts, schedules, Excel reports, and renderings can be created with just a few clicks. ARCHLine.XP is an architectural design software equipped with a fully integrated Open BIM interface, providing the tools to create coordinated and computable building models. Every component, such as floor plans, sections, and elevations are in one comprehensive model. Your BIM projects are fully coordinated and they don't require any manual updates to keep them synchronized. Working with ARCHLine.XP architectural design software you can create: floor plan views, section views, elevation views, perspective views, construction details, printing layouts, schedules, Excel reports, renderings, photo inserts, and even animations. BIM is actually a de facto standard design process to create a building model that essentially provides a robust and rich data source of information. This information is used internally by the CAD software and exported to the project team to add computations such as energy analysis, calculating structural loads, lighting analysis, heating and cooling calculations, etc. You work in one model with many views such as floor plans, sections, and elevations. Your BIM projects are fully coordinated and don't require any manual updates to keep them synchronized. This allows a more efficient work. Drawing in 3D is just one step in the BIM workflow. Instead of being the end product, the 3D model is used as a data source of information by the project team for the performed computations. In order for the project team to be efficient, they require this data in a standardized format. This format contains everything - shared parameters, templates, project parameters, object properties, data sources. This is what makes the "I" in BIM. Using ARCHLine.XP 2017, you can import and view the RVT, RFA files types. RFA (Revit Family) is the format of families of the BIM application Autodesk Revit. RFA objects carry BIM parameters about the object, so instead of working with blocks, you work with intelligent building components. RFA import can be extremely useful, since almost all manufacturers who provide downloadable 'BIM' models usually provide them in Revit format only. One of the most comprehensive BIM libraries is bimobject.com - use it to import actual objects with their BIM parameters directly into your ARCHLine.XP model. ARCHLine.XP offers a buildingSMART-certified IFC import and export, based on the IFC2x3-TC1 version. Using the IFC file format provides you with unrivalled collaboration opportunities, and marks the end of project misinterpretation and data loss. Archline.XP 2018 R1 180907 Build 660 (x64) download links are provided by Extabit Rapidshare Uploaded Rapidgator Netload Bitshare Freakshare Letitbit Dizzcloud and more.